Last weekend marked the 40th anniversary of the Stonewall riots. It’s the weekend Chicago traditionally celebrates gay Pride weekend. My parish has a long tradition of offering hospitality during the Pride parade. Giving out bottled water to parade goers has been going on for many years. 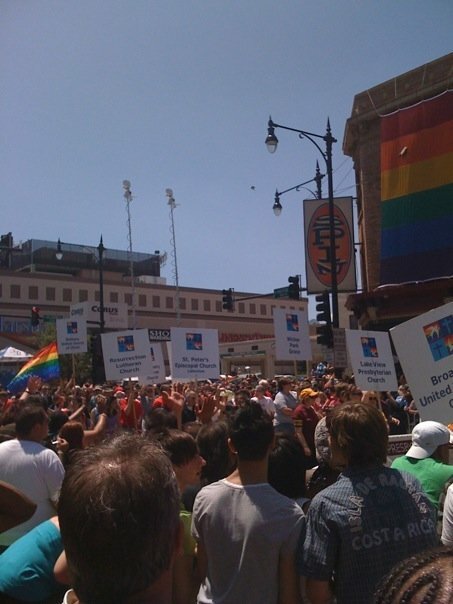 And this year we joined the Chicago Coalition of Welcoming Churches and many folks actually marched in the parade. For me, it was a powerful experience. I missed the step off (and took the picture above) but jumped in the parade a bit later. What amazed me most, standing on the sidelines and watching, was the sheer increase in volume that happened when the church groups walked by. The joyful and exuberant crowd took their jubilee to a whole new level. Cheering, yelling thank you. In the midst of floats with barely dressed men, drag queens and beer adverts (there were a lot of beer floats), the church groups stand out. And I think it’s a visible witness that God’s love is there for all, not only for the few. But the most moving experience was actually being in the parade. Walking down the street in a collar on that day–people kept reaching out to grab a hand, yelling God bless you. I was reminded of the importance of being a symbol bearer, of what it means, as a priest, to stand In Persona Christi, (that Wikipedia link is not the best description, btw, but it’ll have to do for now) to a group of people who the church has, for so long injured and dismissed, or worse, damned. So to be out with the people who have so long been cast to the margins, standing and proclaiming a message of God’s unfailing, all encompassing, never ending love–that seemed pretty important to me. And then the most amazing thing happened. The parade route got backed up. Just as the Coalition for Welcoming Churches was passing by the very small but very vocal group of protesters. As they stood with huge signs about the wages of sin and the doomed state of the world, we stood with signs that said God loves you and You are welcome in God’s house. And the parade came to a stand still. And people from about 22 churches–pastors and people–moved in together and turned and faced the protesters and their signs. No words were said. And, I suspect, no minds were changed, although I can’t help but wonder if there’s not some basic desire for understanding on both sides. And we stood and looked, eye to eye, at people who profess to love the same Lord and Savior and then, started, once again, to march. It’s the problem with being created in God’s image but not being God. We are all flawed and not one of us is perfect and Jesus calls us to look for the Christ in each person. I’d be lying if I said I saw the Christ in those protesters. But I believe my Lord and my God enough to trust that despite all our differences, that somewhere the heart of God lives in them too. There are no easy answers. And so we march on, one foot in front of the other, seeking the good, seeking God and hoping that just maybe, if we are lucky, the light of Christ will shine out from us, to illumine the world that can be so dark. Sarah! Quit making me cry every time I read your blog!